Madison Police Chief Mike Koval addresses an unusual number of gun crimes Monday night into early Tuesday morning. Koval held a press conference on Tuesday, in response to eight weapons incidents in a little over five hours. The chief said, with summer not even here yet, the city likely hasn’t seen the worst of it. The incidents included one in which a six year-old girl watching TV in her apartment was nearly struck by gunfire. Koval said victims deserve to be safe. “Right now it’s not about restorative justice. It’s about rounding people up who are . . . holding this community hostage . . . and getting people locked up. 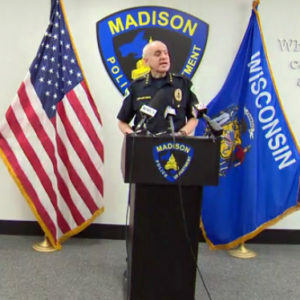 However Koval said the Madison Police Department continues to be under staffed — particularly in patrol officers and detectives.